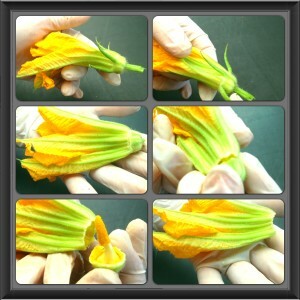 Cleaning the Zucchini Flower is easy, just follow the simple steps pictured here! Prepare flour in a bowl. In a separate bowl, beat eggs, parmesan cheese, salt and pepper. 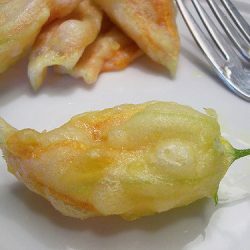 Wash zucchini blossoms and ensure they are relatively dry (use salad spinner or pat dry). Heat up vegetable oil for frying. Dredge blossoms in flour and then in the egg mixture and place them in the frying pan and fry until golden. Enjoy! !